Great size and height. 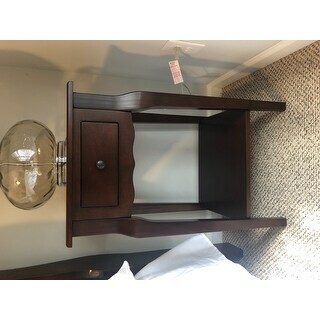 I got this end table in white and l also got the side table. Easy to put together and what is best is the hardware doesn't show which, I think, makes the tables look more expensive. The Daniella single-drawer end table from iNSPIRE Q® Bold features a unique design that complements any style. Combining form and function, this classically styled rectanglar end table can store small items out of sight, making it a versatile piece. The painted finish, highlighted with bright nickel or antique bronze drawer pull, drastically enhance the table's visual appeal. Used as an accent beside your trusty arm chair, or as a pretty bedside pop, this table brings sweet, chic style. Assembly required (see below for instructions). At iNSPIRE Q®, our designer-curated lifestyles reflect current trends and timeless essentials, giving you the know-how to achieve your vision. With diverse style inspirations to choose from, you'll be able to find the one that speaks to you—or mix and match across collections for a style that's all your own. For the price, these are great! Not a piece of fine furniture, but sturdy, nice looking and price point is perfect for the guest room! 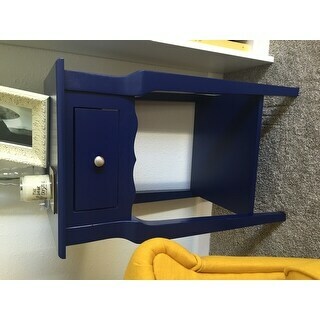 We also bought two of the big blue and yellow store's similarly priced version of this nightstand for another bedroom. 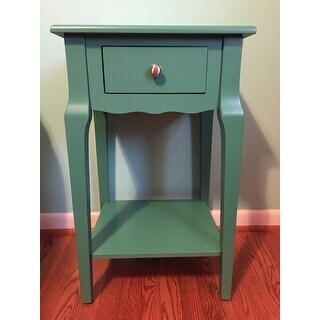 Both were assemble-it-yourself, but these INSPIRE Q nightstands come in more colors, feel more solid, and the finish on the inside of the drawers matches the finish on the outside of the piece (not so with the other store's table). Where the other store's table wins out is on the drawer mechanism. It has actual drawer glides and these INSPIRE Q tables do not (drawer just slides into the hole). Overall, we are happy with this table and would buy it again! I was suprised when I received this item to see it was real wood instead of pressed cardboard like other furniture. The color is exactly as shown I ordered the grey table. This table was also very simple to put together. Overall im greatly satisfied. I have purchased 3 of the INSPIRE Q Daniella end tables and all of them are nice. They were easy to assemble, bright colors, and what would appear to be real wood. They're definitely a right-for-the-price item. I'm very happy with this purchase! 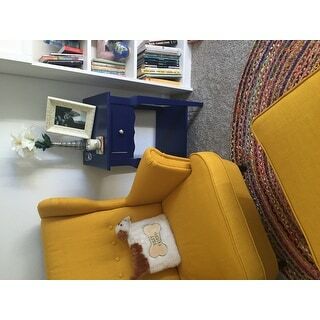 I bought the blue end table for my library nook in my second livingroom. It's a small space and the table fit perfectly. The drawer is a plus as I wanted something to have a little storage. I received the table on time and in great condition-no damages! It was very easy to put together. Took me 15 mins tops. It's made out of real wood which was a selling point that I read in other reviews before purchasing. I totally recommend this end table. Wow, surpassed my expectations! Surprisingly nice quality. I purchased two of the espresso color and they match my existing bedroom furniture perfectly. They make beautiful night stands. The 28 inches is a great height for my high bed. I struggled to find something tall enough elsewhere. The boxes were very light and easy to carry into my home. Assembly was simple and took 15 to 20 minutes for the first one and maybe 10 to 15 for the second one. Honestly, the hardest part was getting all of the hardware out of the packaging it came in. Everything was under a hard plastic cover in little compartments and labeled nicely but the paper backing was impossible to get off and I ended up having to cut open each little section individually. My only complaint is regarding the assembly of the lower shelf. It didn’t fit snugly into the legs but rather each corner of the shelf seemed to lightly rest in the cut outs and there were no pre-drill the holes for the screws. Made me uncomfortable to have to put screws straight through the legs. I was worried I would split the wood. 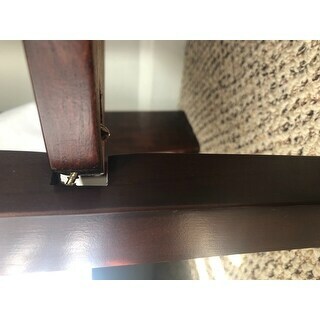 Also due to assembling the nightstand upside down, when flipped, I was left with shelves that don’t rest on the lower part of the cut outs but instead are suspended from the screws, as shown in the photo attached. It will be fine because I don’t plan to rest anything heavy on the shelves but this doesn’t seem quite right. I don’t want to redo this part because I will be left with multiple screw holes in the legs. Overall I’m very pleased with the aesthetic of the pieces so I can deal with it. This sturdy little table is perfect! It comes in an assortment of wonderful, contemporary, colors that will fit everyone's decor. It was a hard decision, but I finally settled on the sky blue. So perfectly true to the picture on my phone. But, what is the most wonderful things about this table is that it is not going to fall over if you leave on it! This little table is SOLID. Besides being well made, the little bit of assembly required (words that terrify me ), is easily done FOR REAL! No new holes needed to be drilled and the directions were not in Englchin. (You know what I am talking about, when the person who wrote the instructions does not have English or Mandarin as a first language,) Any way.... Great table. Easy to assemble. Sturdy. True to color. Great price. I would say... That is Five stars! I am very pleased with my purchase of the Daniella 1-drawer wood storage accent end table. I purchased two of them to out on either side of my bed. One of them arrived perfectly and setting it up was easy. Unfortuntely, the other had chipped paint in spots that wil time would peel in an unfixable way. However, in about a 3 minute phone call (waiting and actually talking about issue), a fabulous customer care agent sent me a free return label for the damaged table as well as a replacement. Overall, very pleased. The only thing about the table is I think the color is darker than the picture online, but I still like it. We were looking for cheaper night stands for our guest room and settled on these in the midnight black. They were around the same price as Ikea night stands, but style-wise, these look more high end and expensive. Assembly was fairly simple and came together pretty easily. 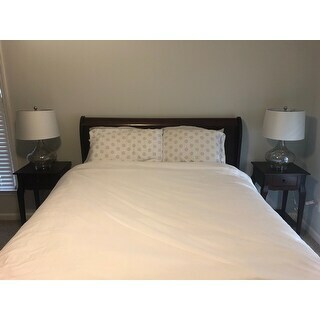 The height ended up being perfect for our guest room queen bed, which means their measurement specs online were spot on. We ordered 2 of these and 1 of the night end tables were missing the lower shelf, but after placing a quick call, we got an apologetic and quick response that a replacement part would be shipped out within 1-2 business days, so happy with the customer service too. 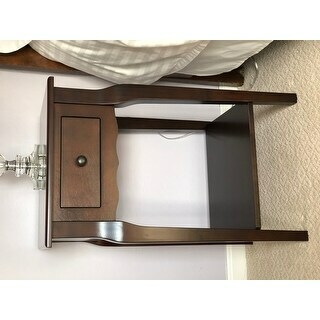 The drawer has a little extra gap around it so it's not perfect, but for the cheap price, think it's a solid deal and would recommend to others looking for a cheap, simple end table/night stand. 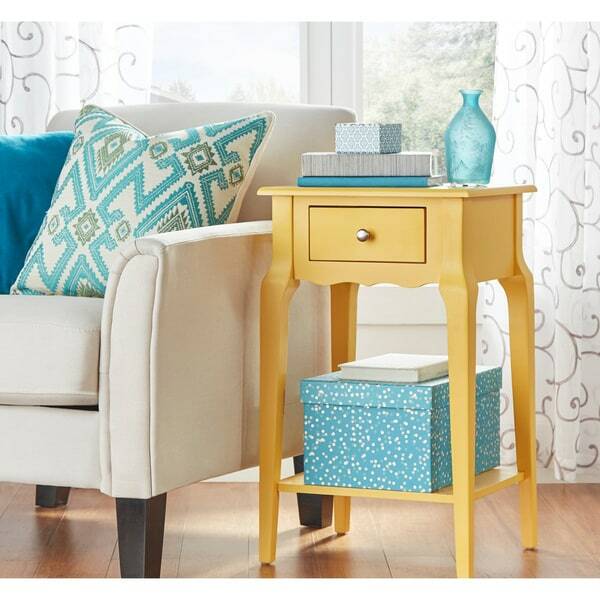 I ordered this accent table along with the larger, sofa table, as they match perfectly. I ordered the grey. As I put in my review of the sofa table, this is REAL wood, of great quality, with a really nice paint job. I mean, they both look like expenses pieces, which I love for my small apartment. I really like the addtl shelf on the bottom, which I'll use a small basket for winter scarf/hats. Another thing I just thought of, and which was surprising to me, was how TALL these tables are. Again, adds an elegant feel to them. By other furniture (cheap *** items I'm replacing) looked so small compared to these! These seem to me like good quality, "forever" pieces. Easy to put together, affordable and fun colors! Would highly recommend these tables. They were easy to assemble. Sturdy and they look great in the bedroom. Watch for sales, the day after I bought them they were HALF the price. So unless you really need them STAT, wait and watch. Ordered 2 of these in gray for my guest room. Very cute and easy to assemble. I will say, it is more of a blue-ish gray as a heads up! This is exactly what you read -- a relatively inexpensive nightstand. Not quality, very lightweight and very small. I needed small with a bottom shelf for clients' guest room. I purchased two, knowing I would replace the plain knob. Black was purchased and it was a bit of a blue black. Not iron color, but not offensive. This is a good purchase for a guest room as it would probably not get demanding use. Drawers slid in and out well enough, but not sturdy at all. Dressed up with a 1/2 price ornate Hobby Lobby knob, it worked well in this scenario. This handled a 3 pound lamp but would not handle much else as it quickly became a tiny bit top heavy. If you have a limited budget and need a small nightstand, this is a very good fit. I would estimate a 3-5 year lifespan on this one, probably until they are ready to update again. 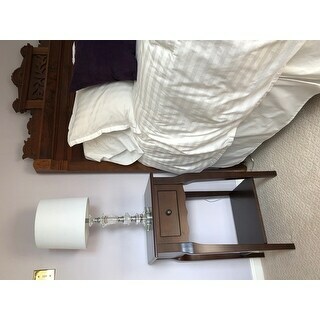 I searched around A LOT to find a bedside table this width, depth and height, with a drawer and an open shelf to fit in a tight space next to my bed. I use the shelf to hold my Himalayan Salt light, which gives off a great ambiant light through the shelf. Very happy gor the purchase. This is my second purchase from Overstock and again I am extremely pleased. This table is used next to my chair in the living room. It really is great quality and was like the other table I purchased, very easy to put together. I bought the Expresso color to blend with my furniture. I love the underneath shelf as I keep a small wicker waste can on it. The drawer serves a lot of purpose for me as I keep numerous items next to my chair and keeps down the clutter. My handy tablet/pen, mail and items I may need throughout my day !! It's perfect for what I needed. The price quality and price were perfect also !! this spring purchased two of these end table for our home in Mexico. One in blue and one in yellow... they were easy to put together and the colors as promised on the website. The blue one was complete but the yellow one lacked the bottom shelf. When we returned home from Mexico called customer service and it was mailed to us within the week. Great customer service and are happy with the tables. I bought a pair of these tables in deep blue, to use as nightstands. They look beautiful in a guest bedroom with deep gray walls, all-white plush comforter set, and semi-sheer white lace curtains. I thought the colors would work well, but the effect is even lovelier in person. Tables would work in a shabby chic decor or even a traditional one. LOVE the unusual shape; the drawer is small but very adequate, and slides in and out smoothly. Tables were easy for me to assemble using only a small drill. All hardware and drawer pulls were included—no missing screws! Great purchase that just “makes” the room. This is a cute little end table, well made and easily put together. However, the color is misrepresented. It is a VERY orange yellow. It just did not work for the space intended. At all. Disappointing to say the least. Happily, Overstock made the return as painless as possible! Nice color choices!!!! Give it a try! We are very pleased . Our daughter just adores it. I am satisfied with the quality and it was easy to assemble. It goes against the saying, “ You get what you pay for.” This time more than pleased! I purchased two tables in grey. They were very easy to assemble. The paint on both was flawless - with the exception of one leg had a paint run. 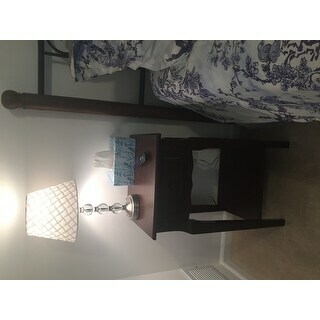 The quality is fantastic, I like the height too - taller so it sits well next to the bed. I would definitely buy again. Highly recommend! Love these side tables as night stands in our new guest room. Matched great with our dark brown furniture! Easy to assemble and a great price. "I need a table 29" high. Why does the item description say 25-29" in height?" Dimensions (overall) are: 28 inches high x 16.75 inches wide x 14.75 inches deep. I hope it helps. "Interested in the Daniella 1 draw wood storage accent end table in white. When will it be back in stock?" The white option is expected to be back in stock in late June. "Charcoal black option not showing?" That option is currently out of stock. It is expected to be back in stock in late April. 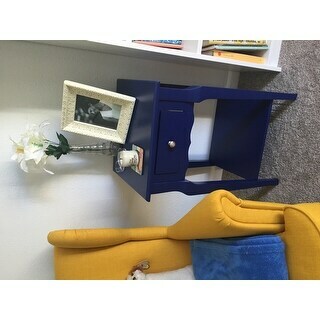 "Looking at Daniella 1-drawer Wood Storage Accent End Table by iNSPIRE Q Bold. The size range varies in description? How do I know what H/W/D I will receive?" This end table measures approximately 28 inches high x 16.75 inches wide x 14.75 inches deep. "Is this a sunflower yellow or bright yellow?" It is school bus yellow. "Is the marine green a more of a teal color or light blue bc the picture above of the single table is more light blue but the picture of all the tables together it looks more dark. Need help bc I really like this table." We bought the twilight blue. It is dark blue. it is definitely more on the green side.